Each section or department plays a very important role for the membership of our chapter. There is not a single section aboard which could exist without the others, so they are equally important. The same can also be said about the members. All members, no matter what their job is, depend on each other to make the chapter the best experience possible for everyone else. The Future Imperfect definitely depends on team work to get the job done. The Commanding Officer runs the day-to-day business of the chapter. This person is the chief spokesperson for the group, maintains order and function, and is responsible for the execution of STARFLET policy and orders. This person is also responsible for the interpretation and compliance with STARFLEET and diplomatic directives. 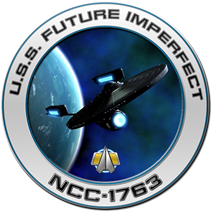 The CO’s primary responsibility is for all monthly reports, and the CO is answerable to STARFLEET for the overall performance of the chapter. This person is responsible for keeping all records pertaining to the chapter, and is also legally responsible for the chapter’s funds. The Executive Officer, also referred to as the First Officer, is the right-hand person to the Commanding Officer. This person implements and carries out directives, and serves as second-in-command of the chapter, with the same responsibilities as the Commanding Officer in his/her absence. The Second Officer serves as commander in the absence of the CO and XO. The chapter defines the other duties of this person. Appointing Division Chiefs, rather than having the CO and XO do everything themselves, is a great way to get others involved in the operation of the chapter and take a lot of the weight off of the CO. The Command Section oversees all other sections aboard the Future Imperfect. They receive the monthly reports from all department heads, submit the chapter’s monthly report to STARFLEET, coordinate activities hosted by the chapter, and act as representatives to STARFLEET and Region 13. The Commanding Officer or CO (President) and Executive Officer or XO (Secretary) serve under this department as well as the Command Assistant. The Operations Section Chief acts as the Treasurer of the Organization. Chapter communications also serve under the Operations Section Chief, which are the Newsletter Editor, Webmaster and Public Information Officer. The Tactical Section is responsible for ship board security, internal investigations and emergency preparation. They also act as escorts and our games master as needed. The Tactical Section Chief is also a trustee for the chapter. The Engineering Section acts as our network administration as needed at ship functions and away missions. They are also the FCC Control Operator and a trustee for the chapter. The Science Section acts as the STARFLEET Academy Liaison for the chapter. They coordinate away missions and all science-type projects undertaken by the chapter. The Science Section Chief is also a trustee for the chapter. The Communications Department is responsible for the chapter by-monthly newsletter called the “The Continuum Report“. The department also represents the chapter and coordinates with both civilian and military agencies, and the media. This is the ‘holding department’ for new members and members who haven’t decided which section to join yet. They frequently scrub the head (restroom), take out the trash, and wash dishes in the galley (kitchen). You don’t want to stay in this section very long, so make sure you start talking to section chiefs very quickly after beaming aboard! The Executive Officer (or XO) oversees this section.